The Medallion engines, which first appeared in 1961, could be seen as poor mans Tee Dees. Like these, the Medallions were designed by Bill Atwood. 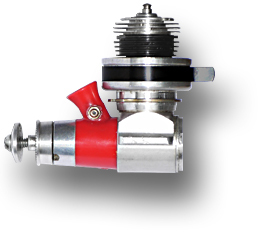 Production costs were reduced by replacing the complex venturi assembly of the Tee Dees with a simple plastic part and a traditional stick-through spray bar and needle system. Despite looking so similar, both families had only a few parts in common: crankcase, rear cover, propeller driver, collet, and in case of the .049 piston and conrod. 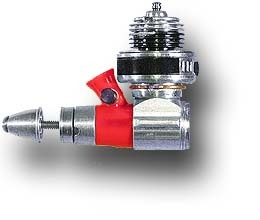 The inlet valve of the crankshaft was a simple drilled hole, while the Tee Dees came with a machined rectangular opening. 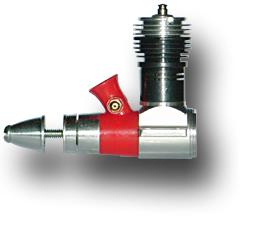 The cylinders used a single transfer flute instead of the two found in the Tee Dee cylinder, which also reduced manufacturing costs. The Medallions can be described as nice, affordable sport engines. The engines were prepared for the same drill through pressure tap to pressurize the fuel tank as it can be found on the Tee Dee series. 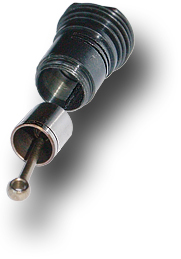 This feature offered a slight performance improvement when used with a slightly enlarged venturi bore. Generally, this resulted in a more critical handling of these engines, though. This is the smallest engine of the Medallion family. Only these small Medallions came with a spinner; the larger models were equipped with a drive washer. The #2 cylinder has one bypass without any boost flutes. A review of this engine can be found in Model Airplane News, September 1963. This Medallion .049 was equipped with with the simple rotating throttle ring mounted on the outside ground cylinder. 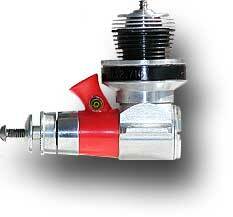 To compensate the power loss caused by the throttle, the #3 cylinder has a second bypass. Otherwise the engine is identical to the #240 engine shown above. 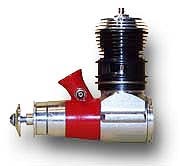 This is a version of the Medallion with the rotating, adjustable throttle muffler. 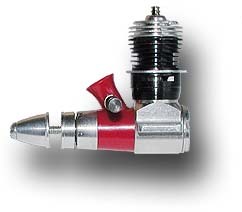 The #1 cylinder is outside ground to accommodate the rotating throttle muffler, has double exhaust slits and two bypass channels each with a boost flute. The muffler does not have an exhaust stack. Here we have a .049 Medallion with the combined carburetor/exhaust throttle control and its linkage. 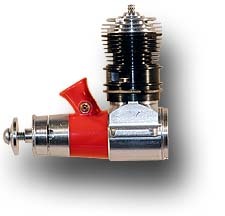 The adjustment lever moves a piston in the exhaust duct and also connects to a throttle flap inside the carburetor. This is probably the best combination to achieve low rpm on these small engines. 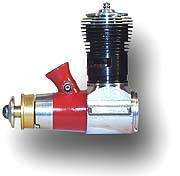 The engine was sold complete with mounted throttle, but the throttle assembly was also sold as a separate item which had to be installed by the owner. A test report on this engine was published in MAN June 1966. In 1996 NFFS president Bob Beecroft approached Cox to produce 300 Medallions for the NFFS (National Free Flight Society). The idea was to allow for easy swapping from ½-A to A for “Nostalgia Free Flight” events. To make the illegal usage of Tee Dee .051 cylinders impossible, these Medallions were to have dual slot exhausts. The transfer system of the untapered cylinder consists of two bypass flutes each having a single boost channel (the Tee Dee hast two boost channels). The later Killer Bee .051 has exhaust slits of different size. The piston shows an added grove to indicate the .051 displacement. Just at the same time Estes took over the reigns at Cox and they were not much interested in such a small and not very profitable production run. In the end, 258 engines were produced and shipped in December 1996. The small production run makes the Medallion .051 a quite rare engine - the much touted Venom was made in about 1000 samples. In contrast to the standard production engines these engines bear engraved serial numbers ranging from 1 to 258 - a leading 5 was added to indicate the unusual displacement. All engines were sold through the NFFS to individual free flight enthusiasts. A complete record of the engines and their numbers exists. The pictures sample is #5238. Thanks to Robert Beecroft for supplying the background story about this engine. The Medallion .09 was re-introduced with an exhaust throttle ring in 1983 (see below) and the final production was the version with the rotating exhaust throttle (1988 to 1996). I received to upper sample as depicted with a gold drive washer which it might have received at the factory due to shortage of plain drivers. I have also found some .049 Medallions equipped with gold anodized drive washers. 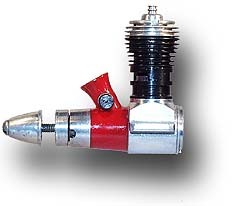 In the 1980s, the simple addition of a rotating exhaust throttle ring and a box with a colorful badge converted a standard Sport and Stunt engine into an R/C engine. In these years, the engines came in a clear plastic box with a cardboard display stand. Tools and instructions were hidden in a compartment at the bottom of the box. Here we have a .09 Medallion with the combined carburetor/exhaust throttle control and its linkage. 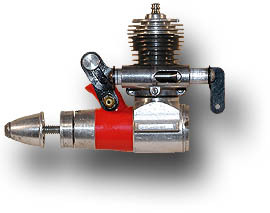 The mechanical setup is identical to the .049 throttle shown above. Of course, the .09 could also be equipped with the patented adjustable muffler ring as shown here. These mufflers were available for all engines, from .020 to .15. Initially they consisted of a aluminum body, a steel cover disk on top and the adjustable steel band. Later models had a hex flange came with an additional aluminum exhaust tube. 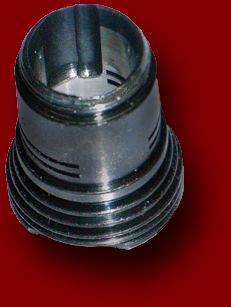 This is another variant of the Medallion .09 with the rotating, adjustable muffler unit like on the .049 R/C (#250-1) shown above. 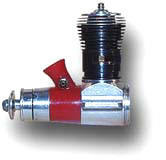 The rotation of the exhaust throttle was performed by a wire pushrod attached to the circlip at the base of the muffler. This big brother of Medallion heritage stands out as one of the relatively few «big block» engines of this manufacturer. The cylinder has one bypass and two exhaust ports. Other engines of this size were the .15 Tee Dees, the Olympic, and the Sportsman. All these larger engines, especially the Tee Dees were creating quite some vibrations, which could lead to disaster to R/C receivers and servos. 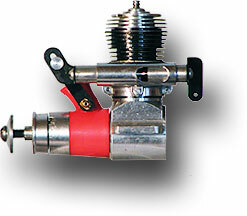 Similar to the Medallion above with the exception of the barrel throttle assembly and the matching outside ground cylinder. 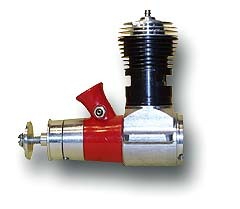 The cylinder provides improved gas transfer by using two channels. Finally a Medallion .15 with the combined carburetor exhaust throttle. Again, the exhaust throttle casing is a fine casting which fits the cylinder perfectly. 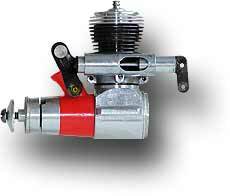 The linkage between exhaust and carburetor is made from black oxide steel.